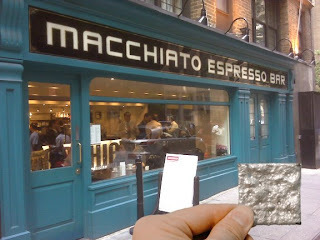 The owner of Macchiato understands espresso like no other proprietor that I've found in New York. He spent 6 months with a Seattle roaster perfecting a blend just for this store. The espresso's body is rich, balanced and smooth with a slight caramel flavor and chocolaty after taste. If you're a caffeine junkie, you won't need to hide the coffee under syrup or foam. Macchiato is an amazing oasis of quality food and coffee in midtown's vast fast food wasteland. You will feel welcome from the moment you walk in. The service is great, the espresso is amazing, and the prices are on par for midtown -- which makes Macchiato a bargain for the quality you get. On 44th Street between Lexington and 3rd Avenue. The shop is just a half block out the back door of Grand Central, so if you find yourself waiting for a train, go over and try this amazing espresso! Heck, if you love espresso like I do, you'll even be o.k. missing your train!